I have been the pastor here at TECCOE, as we call it for short, since 1998 and I hold my ordination credentials with the Conservative Congregational Christian Conference (4C's). I serve on the Executive Committee of the New England Reformed Fellowship and I am a co-chairman and regular presenter for the Reformed Congregational Fellowship Conferences. Additionally, I have been married for 45 years to my wife Kathleen and we have two married daughters and five grandchildren. I enjoy my family, sailing, guitar, old British sports cars (finished restoring a 1958 MGA), trains, western movies, and history, particularly the Civil War. 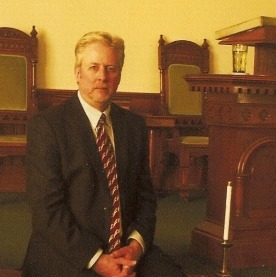 I believe my pastoral calling to be one chiefly of being a preacher and teacher of God's whole counsel in His Word "for the equipping of the saints for the work of ministry, for the edifying of the body of Christ, till we all come to the unity of the faith and of the knowledge of the Son of God, to a perfect man, to the measure of the stature of the fullness of Christ" (Ephesians 4:12-13). If I can be of any service, please feel free to contact me by email, or call me at 508.238.3161.